The $38 million exit package going to former Tribune chief executive Dennis FitzSimons is enough to cover the annual pay and benefits of more than 500 journalists in a metro market. The feet-on-the-street value of the deal is relevant in light of the widespread expectation that the company is headed for some extreme belt-tightening as the new owner, Sam Zell, attempts to produce sufficient cash to fund an estimated $1 billion a year in interest payments on the largest burden of debt ever assumed by an American newspaper company. Fitz’s handsome parting gift would be enough to pay some 543 reporters, copy editors or photographers at a big paper like the Chicago Tribune or Newsday, assuming average annual comp and benefits of $70,000 a year per newsperson. At a more expensive place like the Los Angeles Times, the sum might fund the efforts of perhaps only 425 journalists a year, an amount that’s roughly equal to half the newsroom staff. In markets like Fort Lauderdale or Orlando, where journeymen journalize for probably $50,000 apiece, the Fitz package would fund 750 newsies for a year. The more than $10 billion that Tribune Co. is borrowing to take itself private will be more than eight times its operating profit for the last 12 months, or nearly 2½ times the industry’s average debt burden. That would be a mound of debt for any company in the most robust of industries in the sunniest economic times, which these ain’t. Unless Sam Zell knows something the rest of us don’t, it is not clear how he can meet the quarterly interest on $1 billion in debt without either aggressively increasing sales, sharply reducing expenditures – or both. Given the uncertainty about the ability of any newspaper, including the Tribune properties, to quickly reverse years of steadily decaying sales, it would seem that Sam has no choice but to throttle expenses as fast as he can. And that means, among other things, reducing the work force in his newsrooms, where headcount is more elastic than, say, the number of people needed to run a printing press or pilot the delivery trucks. While the Fitz kiss can’t be blamed for the bulk of the cost-cutting almost certain to occur early in the new year, it is also fair to note that more newsroom jobs could have been spared – and, therefore, more stories could have been covered in the future – if he could have gotten by on a leaner exit package. Instead, the Fitz deal, in its own small way, will contribute to fritzing the company’s news coverage for a long time to come. In a historic first, online media companies collectively will sell more ads in local markets this year than such individual hometown media as newspapers, broadcasters and yellow pages, says an independent research firm. Borrell Associates predicts that online-only media companies will claim 43.7% of the $8.5 billion expected to be spent in 2007 on local advertising, usurping the long-time lead of newspapers. While newspapers three years ago controlled 44.1% of the local market, they will capture only 33.4% of sales this year. The growth of the online media companies “came mainly at the expense of newspapers and yellow pages publishers,” who have lost a combined 19.6 points of local advertising share in the last three years, says Borrell. The full breakdown in the relative market share for local media companies, and I do mean breakdown, is illustrated below. Assuming Borrell’s math is right, this means mega-portals like Google and Yahoo; directory services like Local.Com and Business Com, and other virtual media companies are out-localing the locals without spending the enormous sums that traditional media companies must continue paying to create content, run printing presses, broadcast 24/7, publish fat phone books, and, last but not least, sustain their costly resident sales staffs. This latest evident blow to the once-unchallenged hegemony of local media adds a new and unsettling dimension to the long-running debate over whether the weak ad sales at newspapers result from a cyclical economic downturn that someday will correct itself or from a fundamental, or secular, shift in the structure of the media business. While it would be terrific if John were right, the apparent loss of local-media dominance identified by Borrell suggests that publishers have not become “digitally-centric” enough to expect to be in very good shape when the economy eventually recovers, as it always did in the days when oil was cheap, the dollar was king and the globe wasn't warming dangerously. 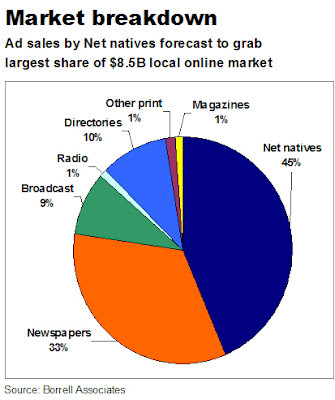 To the contrary, most newspapers and other local media have adopted a strategy of trying to build their online businesses by selling new media to the old print or broadcast customers who either (a) don't cotton to interactive advertising or (b) aren't in the market for low-price, high-volume and indiscriminantly targeted banner ads. The misguided marketing has been particularly disastrous for newspapers, given that advertisers in such key classified categories as auto, employment and real estate are redirecting ever-larger shares of thier former print budgets to such optimized online verticals as AutoTrader, Monster and Realtor.Com. And that's not to mention the ever-popular, and mostly free, Craig’s List. If newspapers (and others) want a brighter future than appears to be in prospect, they need to begin leveraging their rich reservoirs of unique local content to create inexpensive-to-produce sites that can serve readers, non-readers and advertisers alike. They also need to empower the smartest net-savvy people they can find to create, market and sell modern Internet and mobile products that will enable them to compete with a straight face with the interlopers who, at the moment, are beating them rather soundly at their own game. The new brooms poised to sweep through Dow Jones and the Tribune Co. aren’t arriving a moment too soon. Although no one, including most likely the incoming proprietors themselves, knows exactly what Rupert Murdoch and Sam Zell will do, at least they’ll rescue their companies from the decades of bland, unimaginative and ultimately unsuccessful corporate stewardship that, history suggests, is a decidedly unnatural way for a newspaper to operate. The impending arrival of Messrs. Murdoch and Zell is sending shudders through both companies, where pressmen and publishers alike are worried about everything from the comparatively trivial disruption of their daily routines to whether they’ll still have jobs in six months. You have to feel for the people working at those companies, and, having been there myself, I do. But DJ and TRB, like the rest of the industry, are overdue for a shakeup. So, you have to give Messrs. Murdoch and Zell a ton of credit for their willingness to wade into the triple-dip crisis of declining circulation, collapsing ad revenues and shrinking profits – especially at a time in their lives when they could be enjoying extremely comfortable, stress-free retirements. As natural-born entrepreneurs, each will take a clear-eyed look at the daunting realities of their businesses and, true to the DNA that makes them who they are, will start taking some serious, innovative action. With luck, more changes than not will be for the better. In so doing, these two gents will be taking their companies back to the way newspapers used to be before they went corporate. Back, that is, to when bold, passionate and visionary – and sometimes crazy, corrupt and evil – individuals ran nearly all of the country’s newspapers. From the time the first colonial printers foreshadowed Google’s business by leveraging their scarce and superior technology to aggregate and distribute information for the benefit of the readers and advertisers who paid handsomely for such services, newspapers typically were owned by individuals who had not only a desire to make money but also sought an out-sized voice in their communities. Bad as it could be when a publisher abused his power (and many did), the swashbuckling ownership that characterized the industry from its inception to the middle of the 20th Century infused it with the innovative verve and commercial strength necessary to adapt to the disruptive technological and demographic challenges that were as formidable in their days as the ones we are experiencing now. Newspapers lost most of their entrepreneurial edge in the 1960s when companies like Gannett (1967), New York Times (1969), Washington Post (1971) and Dow Jones (1976) sold some of their stock to the public – in many cases to satisfy the demands of multiple generations of heirs who, though perfectly thrilled to be members of a famous publishing clan, also wanted to get their mitts on some extra cash. 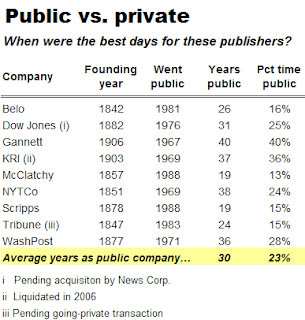 As you can see in the table below, the average publishing company that has been around for more than 100 years has been publicly held for less than a quarter of its lifetime. And most of the best years for those companies occurred when they were still in private hands. Coincidence? You be the judge. Although DJ, NYT, WaPo and some of the other publicly held newspaper companies have two-tier stock structures that give the founding families certain continuing control over their businesses, every publicly held publishing company – like all public companies – is forced at the end of the day to answer to Wall Street. And Wall Street’s unrelenting demand for predictable and sustained profit growth means that newspapers, once a wonderfully independent and idiosyncratic lot, had to grow up and go corporate. In the last five decades, newspapers came to be run by bean counters and soothsayers whose idea of leadership was to do everything possible to ensure that the operating performance of their companies never varied from between 9.8 to 10.2 on a 10-point scale of predictability. For the most part, the top industry jobs came to be populated by people more skilled at managing than innovating – and who, despite their formidable analytical, administrative and public relations skills, had no more feel for newspapering than for running tire stores or meat-packing plants. The growing remoteness of corporate newspaper managers from the realities of the market wasn’t a problem in the pre-Internet era, when business was good and there was scant competition to prevent newspapers from racking up regular increases in ad rates, gross revenues and profits. When the terms of the game changed, as they did radically with the arrival of the Net in the mid-1990s, the corporate managers could not understand what was happening. As their carefully crafted business models fizzled, the most creative ideas that most newspaper managers could muster was to cut staff, cut page sizes and cut circulation. But chiseling is not a growth strategy. While Messrs. Murdoch and Zell initially may order plenty more cuts of their own, they know there is no substitute for building audiences and sales. Because they, unlike their immediate predecessors, won’t be subject to quarterly kibitzing from Wall Street, they can invest some of their profits in the sort of long-term, revenue-building initiatives that have been in short supply lately among publishers. Beyond the particulars of whatever efforts Messrs. Murdoch and Zell undertake, their most important contribution will be to instill a long-lost sense of daring and mission to companies that have suffered under dangerously timid, myopic, uncreative and demoralizing management at perhaps the most pivotal moment in their rich and fabled histories. The Omaha World-Herald was caught completely flat-footed today when a gunman killed eight people in a local mall, producing the worst online coverage in memory by a newspaper with a major story breaking in its own backyard. If you work at a newspaper, please don’t let what happened in Omaha happen to you. We’ll discuss the fundamentals of contingency planning in a few minutes. But first, let’s review the carnage – and I don’t mean the tragic casualties at the mall. Less than half an hour after gunfire broke out at the Westroads Mall shortly before 2 p.m. today, local television and radio coverage was well under way, according to a detailed account at Omaha City Watch, a blog written by Jim Minge and Sean Weide. The television coverage included all the trimmings: live shots, interviews with survivors, details about the assailant who evidently killed himself and pictures taken by eyewitnesses at the scene. But Omaha.Com readers weren’t missing much. Once the outage was overcome, readers got a single lead story and roundup of predictable harrumphing from local politicians. There were no splash graphics like those at Fox News; none of the hundreds of reader comments like those at USA Today; nothing like the eyewitness photos and elaborate aerial map at CNN, and no sign of the extensive live video aired and webcast throughout the day by KETV and other local outlets. While Omaha.Com managed to post a single, well-hidden video, its production values were so weak that it was difficult to hear the shaken victims over the sounds of idling emergency vehicles. The site asked people to email comments, pictures and video but none were in evidence nine hours after the event. The newspaper hastily launched a blog on the Blogger.Com platform that invited user comments, but the one-paragraph blog – and the resulting handful of comments – were painfully lame. After working in the business of electronic content delivery for more than two decades, I know that anything can go wrong – and will – at such inopportune moments as a Super Bowl or emergency like the one in Omaha. The best way to prevent such embarrassing collapses is by over-engineering your systems and training all hands in a well-orchestrated disaster-recovery plan. But the worst problems in Omaha were not technical, but editorial. The poor coverage evidently was caused by a lack of contingency planning on the part of editors, web producers, reporters, photographers and all the other people who are responsible for rapidly, thoughtfully and accurately gathering the information and visual assets necessary to tell a story like this in the age of multimedia. While the print product remains the primary business at newspaper companies, their websites are strategically important not only for their long-term revenue potential but also because of their immediate power to engage readers and, most importantly, non-readers. Even though newspapers are no longer part of everyone's daily information-consuming routine, they still rank among the first places many people will turn during a powerful and emotional event like the Omaha shootings. If the newspaper delivers a timely, compelling and sensitive report, it has a good chance of winning new fans and influencing advertisers to ship more dollars their way. When it fails, as Omaha.Com did, it reinforces the concept that newspapers are irrelevant has-beens. While no one can plan precisely for a tragedy like this shooting, newspaper people – who should be ever mindful that any number of online and broadcast competitors are trying to eat their lunch – should have protocols in place to drop everything they are doing to swarm a big story. This includes not just calling the cops, covering the emergency rooms and interviewing the victims but also gathering the electronic assets that make modern storytelling possible. In addition to traditional reporting, newspapers now and ever more need to task reporters, photographers and videographers with hunting down the photos, audio, videos and first-person anecdotes that enrich contemporary coverage by letting real people tell their own stories. This, not the day-old, dispassionate, inverted-pyramid, third-party narrative that guys like me used to write, is the future of the media. 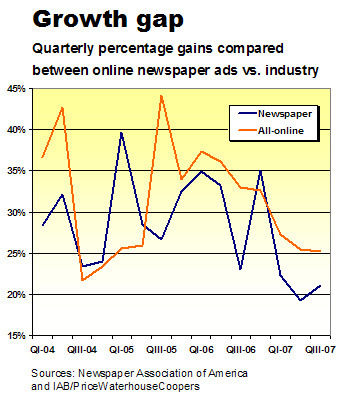 Internet advertising sales at newspapers this year have grown at slower rates than those of competing media, shrinking the industry’s share of online revenues in the third quarter to the second-lowest level since 2004. Notwithstanding sunny press releases from the Newspaper Association of America, the evidence is growing that the industry – which prominently and properly has targeted digital sales as a top strategic priority – is simply not keeping up with the universe of companies that sell online advertising. Online ad sales in all media surged 26% to a record $15.2 billion in the first nine months of the year, according to PriceWaterhouse-Coopers, which conducts a quarterly survey for the Internet Advertising Bureau, a trade organization. By contrast, newspaper sales grew 20.9% in the same period to $2.3 billion. While a sales gain of nearly 21% ain’t chopped liver, the comparatively weak momentum achieved by newspapers means that the industry’s share of the online revenue pie is shrinking at a time when publishers can least afford for that to happen. Because online newspaper sales are growing more slowly than those of their competitors, publishers in the third quarter corraled only 14.7% of the total available revenues. Between April, 2004, and June, 2007, however, the newspaper industry never controlled less than 15% of industry revenues and, in fact, averaged quarterly sales growth of 15.9% throughout the period. Although newspapers were slow to wake up to the threat of the Internet – and even slower to grasp its myriad bountiful opportunities – they actually surpassed the online Internet competition in quarterly sales growth from the middle of 2004 to the middle of 2005. As you can see from the graph below, however, they have been trailing the over-all industry’s growth pace since then (with the exception of the fourth quarter of 2006). One reason newspapers may be lagging is that they have tried to bundle print and online sales into combo packages sold by all-purpose sales reps, who, depending on their pedigrees, either don't get new media, don't get print, or, in a few depressing cases, don't get either. The somewhat counter-intuitive argument that convergence selling is a failure is discussed here at PaidContent.Org and well worth a read. While it would be wrong to make too much of a single quarter's sales slip, it is troubling to note that publishers collectively have under-performed their online peers for three quarters in a row in spite of an intense, high-profile effort to pump up their digital businesses. If the industry is going backwards while trying as hard as it can to move forward, it either isn't trying hard enough or isn't trying the right things. Whatever challenges publishers have faced to date, the situation could get worse, given the slowdown in real estate, the softness in auto sales and a potential reduction in help-wanted advertising caused by the economic "headwinds" predicted for the new year by Ben Bernanke and others. These three advertising categories are the primary drivers of the classified business that represents the largest portion of online sales for newspapers. If online classifieds deteriorate and significant new products aren't mustered rapidly and effectively to replace them, the industry's online growth gap could start turning into a sinkhole. The online search business is about to be upended by a revolution in technology that represents the last, best chance for newspapers and other traditional local media to preserve their franchises. Despite falling revenues and rising online competition, publishers still have the rich archives and potent local presence that make them the ideal partners to team with the next-generation search companies preparing to take on Google and the other incumbents in an industry projected to double to nearly $17 billion in revenues by 2011. Instead of ceding web search to Google, Yahoo and Microsoft – as they almost universally do today – publishers should combine their vast archives with the best technology from the start-ups to create compelling, state-of-the-art, local web and mobile sites. In so doing, newspapers can leapfrog the search behemoths to regain a commanding, and substantially unassailable, digital presence in their respective markets. This opportunity is the subject of a new white paper I have written to explain how publishers can team with the emerging search companies to take advantage of the most compelling online strategy for newspapers since the inception of the Internet. You can get it by emailing me at alan [dot] mutter [at] broadbandxxi [dot] com. With Google’s stock trading at record highs, this may seem to be an odd time to discuss the sophisticated, new technologies that some day could make googling as obsolete as pecking at an old Royal typewriter. But it’s safe to say that today’s middle-schoolers will have far superior search resources at their command when they write their college term papers. They might even have them by the time they start high school. Given Google’s enormous market power (67% of all searches) and profitability (nearly $15 billion in the corporate cookie jar), the company itself may lead the way to the next-gen technologies that will transform search, the largest online advertising category. But the unavoidable inertia typically associated with a corporation of Google’s size also exposes it to challenges from smaller, more nimble, competitors. The Google killer could be a classic start-up that bootstraps itself out of nowhere – like Google did – to become a multibillion-dollar business. But a more intriguing alternative is one that also offers newspapers and other local media companies the opportunity to reinvigorate and defend their once-indomitable franchises. Beleaguered as local media may be, they still have the market presence and unsurpassed wealth of content that make them the perfect partners for the new search companies preparing to compete with Google and the other market leaders. The emerging technologies that could upend the search business are far smarter than the crude, but effective, algorithms that today power Google, Yahoo and Microsoft. The new technologies surpass the conventional search engines, because they identify, evaluate and establish relationships among the billions of discrete bits of information they catalogue, thus enabling them to respond to searches with deeper, fuller and more contextually appropriate results than you can get with Google. The value of these new technologies is best illustrated by considering the limitations of the current state of the art. If you search “apple” today on Google, you get a lot of information about the computer company but not much about the fruit, because Google, rather primitively, sorts and ranks results according to the frequency and prominence of the key words contained in the content it continuously scrapes from the web. Because more people write about iMacs than granny smiths, the outcome is perfectly understandable, but not particularly helpful if you want to make a pie. Most of us can speed the process by picking the right combination of key words on the first or second try. But that reflects the superiority of human intelligence, not the quality of Google’s technology. Still, for all our cleverness as a species, we are able to acquire satisfactory answers to our searches only about two-thirds of the time, according to the limited industry research conducted on this question. That’s the idea of a host of complex new technologies collectively called the semantic web, a term coined by Tim Berners-Lee, who is generally credited with being the father of the Internet. In the semantic web, information would be tagged according to commonly understood conventions, so the word “Spanish” could be recognized in certain contexts as a noun referring to a language or ethnicity and in other settings as an adjective relating to geography or food. To get there from here, a number of efforts are under way to train computers to catalogue vast arrays of content with tags – invisible to humans but intensely meaningful to computers – that allow bits of information to be stored in databases structured according to standardized schema. Newspapers and other content-rich local media can gain an unassailable lead in their respective markets by teaming with the emerging semantic technology providers to efficiently publish targeted and personalized interactive products utilizing the articles, images, audio and video that already populate their archives – or that will be created in the future by their staffs, syndication partners and site visitors. The increasingly granular knowledge of consumers gained by tracking how they use content will enable media companies to cost-effectively sell premium-priced, targeted advertising that intercepts buyers about to make a purchase. The powerful new wave coming in search technology will give media companies their last, best chance to reassert their relevance and re-establish their economic strength. If they fail to seize this opportunity to publish agile, customizable and cost-efficient digital media, there is a great danger that their franchises will be damaged irretrievably.